There's a reason these kabobs are a summer grilling classic. Actually, there are a few: the flavor, the ease of preparation—and did we mention the flavor? Meanwhile, cut steak into 1-1/4-inch pieces. Place steak, mushrooms and peppers in resealable plastic bag. Add marinade; seal bag. Refrigerate 30 min. to marinate. Preheat grill to medium heat. Remove steak and vegetables from marinade; discard marinade. Alternately thread steak, mushrooms and peppers on skewers. Grill 10 min. for medium doneness, turning occasionally. 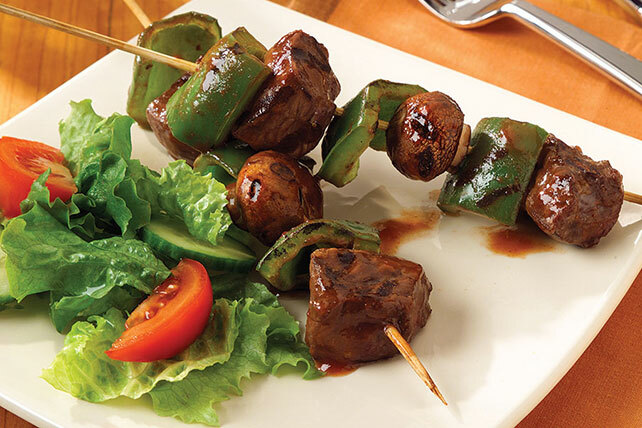 If using wooden skewers, soak them in water for at least 30 min. before using to prevent them from burning. To cook steak under the broiler instead of on the grill, preheat broiler to medium heat. Place steak on rack of broiler pan 3 to 4 inches from heat source. Broil 10 min. for medium doneness, turning after 5 min.